The 2,422 Bentleys produced between 1933 and 1939 are known as the 'Derby Bentleys' after the Rolls-Royce factory in which they were built. Rolls-Royce had secretly acquired Bentley Motors from the receiver in 1931 and was determined to honour the magnificent sporting heritage that came with this illustrious brand. Although the cars were based on the existing Rolls-Royce 20/25 and 25/30 models, they were much more than a badge-engineering exercise, with considerably more powerful engines and a more sporting chassis which had been developed for the still-born Supercharged Peregrine project. Referred to when first launched as 'The Silent Sportscar', the Derby Bentley had a Rolls-Royce based 3.5-litre six-cylinder engine fitted with a more sporting cross-flow cylinder head, twin SU carbs and twin fuel pumps. Feeding its 105bhp through a four-speed synchromesh gearbox, the car was good for a genuine 90mph and was widely praised for its combination of speed, refinement and handling prowess. Even WO Bentley himself was reported as saying: "Taking all things into consideration, I would rather own this Bentley than any other car produced under that name." Faced with increasing competition from the likes of Alvis and Lagonda, in 1936 Rolls enlarged the capacity of the engine to 4.25-litres which boosted the power to 126bhp, allowing a top speed of virtually 100mph and notably improved acceleration. On all models, completed chassis were supplied to the leading coachbuilders of the time and a variety of stunning looking cars resulted, marking what was perhaps the peak period of the British coachbuilders’ art. 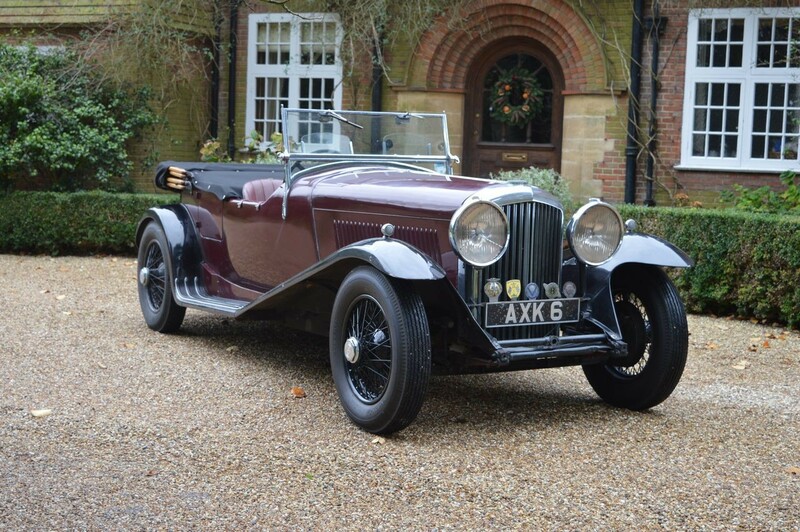 This fine 1934 model was specified by its first owner with saloon coachwork. Nothing is known of its early history until it arrived in the hands of its most recent custodian way back in 1970. We are unclear at what point it lost its saloon coachwork and gained the well-made, elegant and practical four-seater tourer bodywork that it now wears, although it is thought to have taken place sometime in the mid ‘70s. Its long-term owner has kept a comprehensive file of bills dating back to the 1980s showing considerable care and maintenance, with annual servicing and maintenance being undertaken by Rolls-Royce and Bentley specialists, A & S Engineering of Hampshire. There is a bill for a deposit on a new head from Fiennes Engineering in 1990 and in 1997/8, A & S Engineering completely rebuilt the engine with a new block, camshaft and white-metal with bills totaling £27,000. In 2003 the car was improved still further by fitting an overdrive between the gearbox and rear axle, an addition that highlighted shortcomings in the rear axle itself which was subsequently rebuilt at an additional cost of £6,500. Since all of this work has been undertaken, the car has covered some 20,000 miles. A veteran of numerous continental touring trips through France and Spain, the car has more recently been used for local jaunts to Goodwood and for family occasions where it has proved extremely reliable and effortless to drive thanks to the synchromesh gearbox and overdrive. The comprehensive history file includes a photograph of the car with Angela Rippon looking very glamorous in the passenger seat, masses of bills from A & S Engineering, new and old style log books, a buff log book and copy of a maintenance manual. On offer here from a deceased estate and retaining its original London-issued registration number AXK 6, this fine touring Bentley is ready for its next adventure, but where should it be…Monte Carlo, Biarritz, Saint-Tropez? Or shall we let Angela decide?